What do an archaeology loving deep sea diver, a blind ultramarathon runner and a NASA astronaut have in common? They're all set to be powered by wearable tech, of course. The single biggest advantage wearables have over every other category of gadget is that they can be specific. Customised to the wearer. Tailored to the surroundings. Built for one precise purpose. That means that the most useful wearables we'll see over the next five to ten years won't need to be worn 24/7. Or if they are worn 24/7 then it won't be by everyone. This is a breed of wearable tech that's the complete opposite to the jack-of-all-trades fashion smartwatch from Samsung, LG or Apple. That's why we've taken the time to celebrate the miracles, innovations and jaw-dropping scientific advances that the wearable revolution is enabling, and ensuring the world is a better place for everyone. Explorers have been wearing tech for decades - for protection, for oxygen, for easy-to-access information. In 2015 things are getting seriously sci-fi as wearable tech is taking us to places we've never been able to investigate before. The Exosuit, built by Canadian company Nuytco, is a hi-tech diving suit that was used by a team from the Woods Hole Oceanographic Institute, Massachusetts to spend hours exploring a Roman shipwreck off the coast of Crete at the end of 2014. The wreck is known as the Titanic of the ancient world and when the famous undersea explorer Jacques Cousteau visited the site in 1976 he could only spent minutes down there to avoid 'the bends'. As well as getting into tighter spaces than a submarine, thanks in part to rotatable joints, the 40kg Exosuit recycles air which means there's no need for compressed oxygen and it has four thrusters allowing divers to propel themselves through the ocean. 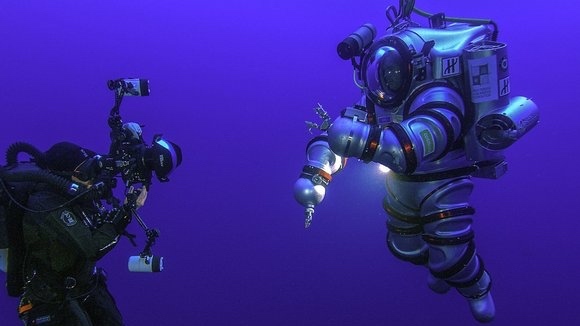 Director and explorer James Cameron, who donated a submarine to the team, was so impressed he said he plans to film the sequel to his blockbuster animation Avatar using the Exosuit. There are also plans to hunt for more lost Roman treasures and sunken British warships using the wearable tech. Truly useful wearable tech doesn't need to look, feel or behave radically differently from the devices being worn by those of us whose idea of exploring boils down to swapping Tesco for Sainsburys to get a grocery shopping thrill. We just recently heard about Microsoft's collaboration with NASA. The tech giant's new augmented reality headset HoloLens is capable of simulating Mars for staff on earth using a program called OnSight developed by NASA's Ops Lab. But as well as working with Microsoft, NASA is taking matters into its own hands. David Miranda, a Kennedy Space Center engineer, and his team are starting a two year project this month to build what essentially is Google Glass for space operations. NASA engineers tried out smartglasses made by Google, Vuzix and Epson, as well as Bluetooth heart rate monitors, before realising that they would need to build their own glasses to make them both useful and safe in space and down here on earth. Light enough with a good battery life is the first criteria. The final device will be used by technicians on launchpads who could view complicated instructions as videos in this kind of heads up display as well as - one day - astronauts on space stations, asteroids or Mars. It's not just astronauts and divers who are using wearable tech to advance bold human achievements, there's a lot of firsts coming up for Bristol based Open Bionics. Its founder 24 year-old Joel Gibbard is building a low-cost, 3D printed prosthetic hand that should be affordable to anyone who needs it. The project is completely open source, so anyone can build their own, and won second place in Intel's Make It Wearable competition in San Francisco last November. The Asimov hand, as it's known for now, was fitted to a teenager last year and in the next few months the team plans to experimentally fit a young girl with no limbs with the robotic hand. “This will be the first time a child is fitted with a 3D printed robotic device," Samantha Payne, Open Bionics' community manager, told Wareable when we caught up with the team's progress since November. 3D scanning limbs with a Structure Sensor then 3D printing the prosthetic out of Ninjaflex is one reason why Open Bionics' hand will cost less than $1000 compared to $30,000+ rivals. “We've completed some huge developments since [the competition]," Payne explained. “The hand is now half the weight, incredibly light, and looks a lot sleeker. The whole hand prints in just two parts." The 1.1 billion people who live with a disability are precisely the people wearable tech will best serve according to Grant Allen, a Technology Program Manager at Google. He refers to these highly customised, useful and hackable devices as 'extreme wearables'. “I set my LG G Watch on fire this morning on a laser cutting machine as I was trying to get it into a prosthetic arm," he said at a StrategyEye talk on the future of wearables. “Take these devices and hack them, modify them, take the software further." Scarab, a sensor you wear on your belt loop, is designed solely to crowdsource information on environmental dangers like carbon monoxide and gamma radiation. Allen points out that many wearable tech devices will be used in ways that their inventors never imagined. For instance, collective data from Jawbone UP wearers in the San Francisco area has been extrapolated “to create a crowdsourced seismograph" of a night time earthquake in August 2014, based on what time UP users in specific areas woke up and starting moving around. The most interesting examples of the extremely useful wearables Allen is championing are planned to have both a mainstream appeal and a very specific use case. The Embrace stress-measuring smartband was a hit on Kickstarter and the founder Matteo Lai recently posted an update. “With our "buy one, give one" program through our private donors and partner, The Epilepsy Foundation," he posted, “we were able to donate a total of 1,540 Embrace watches to families living with epilepsy, in need." And blind runners are excited about using the haptic Lechal smartshoe, which could be a convenient bit of wearable tech to any runner, to navigate their runs on the move. One is these is Simon Wheatcroft. Simon is everyone's favourite blind Ultramarathon runner - he's been on stage at Wired events, made films for Airbnb and talked at Google. He lost his sight aged seventeen and has used everything from Google Glass to the Wahoo Tickr X strap, Misfit Shine and Pebble smartwatch to help him plan and track his runs since then. “I haven't tried the Lechal shoes," he told Wareable. “I would definitely love to though. I have been in to Google to speak quite a few times about wearables and especially haptic feedback, as discrete communication works so much better for navigation especially for the visually impaired." He's excited about both the Apple Watch and the current batch of trackers with optical heart rate monitors but more importantly, a Google engineer is building a custom wearable for Simon to enable him to compete in a desert race solo. “Often navigation systems for the blind are greatly overly engineered and try to solve more than the core problem, for example, adding computer vision and detailing what I am passing by," he explained. “Essentially I don't need to know if its a lamppost or a person, all I need to know is left or right to avoid it." So the watch we are developing really boils it down to exactly what I need for that specific event - point to point navigation. Desert races are often run from one GPS point to another, therefore, I have two GPS points and I need to make sure I run the set bearing between those two points. We are achieving this by vibration patterns so I know which way I am drifting. It is very simple, very focussed but does exactly what I need without the frills." Wearables aren't just useful for exploring the limits of the planet and extending the limits of specific humans, in the future they might help save both. Smart heating, using devices like Nest, is a neat early application of the internet of things but what if we could cut down on the world's huge heating bills by modifying our personal temperature on demand? That's what the smart bracelet Wristify does - it uses heat pumps to send waves of warmth or cooling to your wrist and will be marketed at women when the final device is ready. “We've just successfully launched a beta testing program that received over 1,800 applicants in the two week window," said co-founder Sam Shames. “We aim to nail down our user experience and ensure that we ship a remarkable first product." Wristify isn't alone. There's the Microsoft Research smart scarf which heats up and cools down based on input into a smartphone app and the Digitsole smart heating insoles. Jawbone chief Hosain Rahman recently boasted in an interview with Fortune that with the Jawbone UP3 tracker his company will be the one that knows its wearers are too hot or too cold not Tony Fadell's smart heating company Nest. Smart maternity clothes. Robotic arms that teach us how to draw. Wearable cameras for police. Here at Wareable we hope that alongside the big play for a smartwatch beautiful and user-friendly enough to adorn the wrists of half the world, we continue to see all these small plays aiming to solve one problem, reach one environment or serve one type of wearable tech wearer.